Kale is so hot right now. For good reason too, kale is packed full of all kind of antioxidant goodness, high in fiber, and can be enjoyed cooked or raw, in many different recipes. This is the time of year that the kale just keeps on coming from our csa share and I, always looking for the novel, tend to reach first for whatever vegetables came new that week, leaving the poor kale in the back of the fridge. This week I was determined to put that kale to good use, and pulled two enormous bunches of curly kale out and set to work. I intended to make a “poor man’s pesto” – with kale added to the basil and using sunflower seeds in place of pine nuts (because really, who can afford pine nuts anymore?). As I was mixing it all up in the food processor, I thought the texture was a little different than I had expected. It wasn’t until I was cleaning up and putting all my ingredients away that I realized I had used FLAX seeds instead of sunflower seeds. Whoops. But you know, it was still delicious, and add the omega-3s coming from the flax seeds and this will make for such a healthful meal when tossed with pasta or mixed into hummus (more on the hummus in a minute). For easy freezing, I filled an ice cube tray with the pesto, froze, then popped the frozen pesto cubes into a freezer bag for later use. 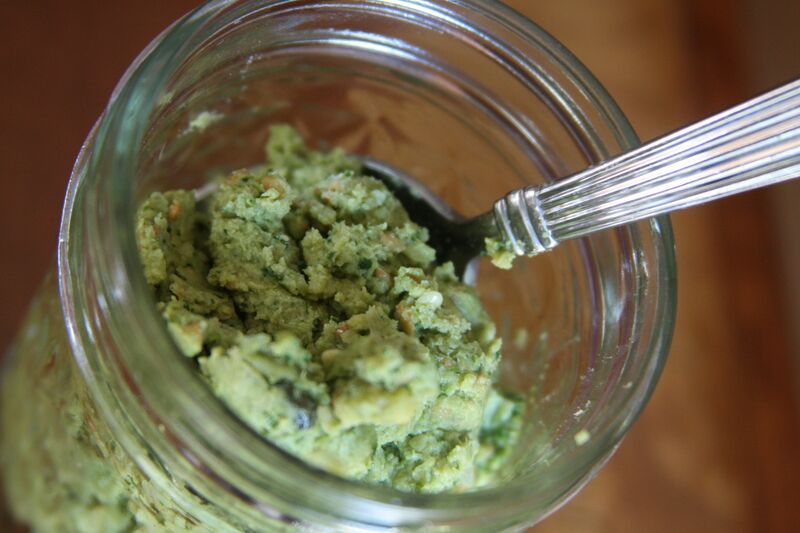 Using equal parts basil and kale gives this pesto great flavor with an added health boost. Flax seeds are a great alternative to nuts typically found in pesto, but if they aren't your thing, try sunflower seeds. Mix all ingredients in a food processor, adding the cheese last. Instead of cleaning out the food processor right away, I left a few tablespoons of the pesto in it and added one can (drained) of chickpeas and about 3 tablespoons of tahini, with an extra splash of olive oil for some really good hummus. With all the kale still left on the counter, I made a huge batch of kale chips, which are almost gone already. I added just a little too much salt which made them simply irresistible. 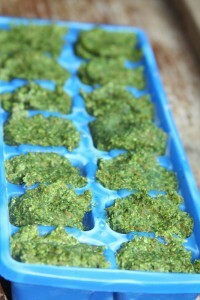 ;) And with all the recipes out there for kale chips, I wont add to the noise. You can find great tips on making your own here.